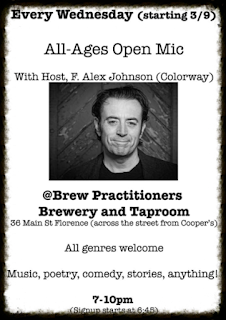 Brew Practitioners, 36 Main Street, Florence, MA. Come join us for an hour-long sing-along. Alex Johnson on the guitar. Following the Group Sing, Alex hosts an open mic at 7:00pm. The regular 7:00 PM First-Wednesday-of-the-Month Group Sing at the Northampton Senior Center won't return until September. Funded in part by the Northampton Arts Council and Senior Services. 36 Main Street, Florence, MA.